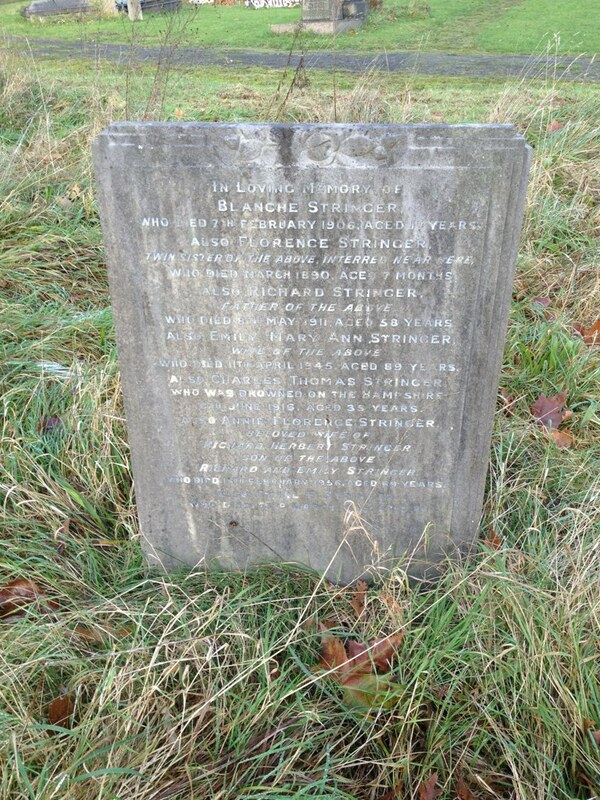 Amidst the untidy contours of meadow grass close to the Brockley Road boundary lies the modest headstone of the Stringer family. It was a serendipitous discovery that led to the realisation that Charles Thomas Stringer with the rank of Chief Electrical Artificer, Second Class was aboard HMS Hampshire on its fateful voyage to Russia when it sank in fifteen minutes after hitting a German mine off Orkney on 5th June 1916. 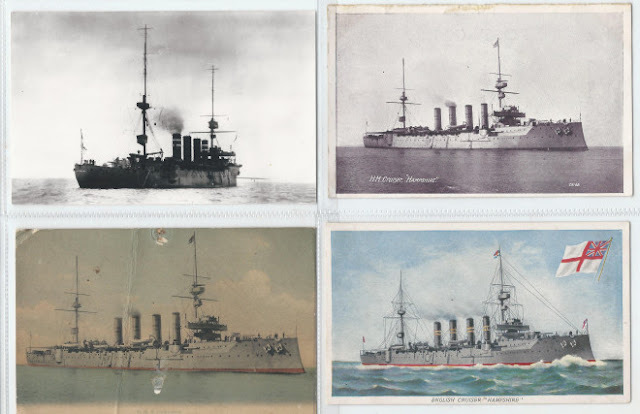 The 141 year old Royal Navy rank of Artificer, dating from 1868 and endorsed in 1903 by First Sea Lord Sir John ‘Jackie’ Fisher, worried at the time at Germanys advances in naval technology, a rank nicknamed ‘tiffs’ or ‘ tiffies’was only recently replaced in 2010 by the term Engineering Technicians! 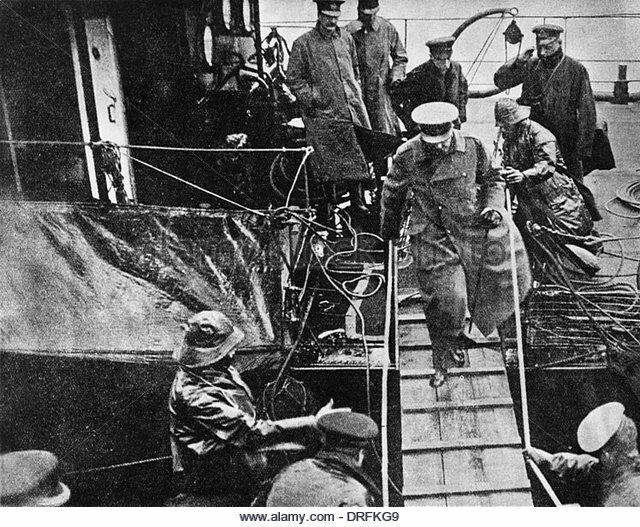 Last photograph taken of Lord Kitchener on board HMS Iron Duke before transferring to HMS Hamsphire- 5th June 1916. 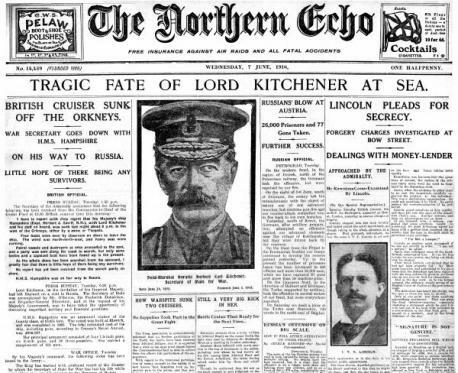 The name of arguably one of Britain's greatest war heroes, Field Marshall Earl Kitchener, Minister of War, will forever be inextricably linked with Orkney. For it was here off the bleak 200 foot high cliffs of Marwick Head on the west coast that the 10,850 ton armoured battle cruiser Hampshire, carrying Lord Kitchener on a voyage on a top secret diplomatic mission to Archangel, North Russia, struck a mine and sank with the loss of 736 officers and men including Lord Kitchener who names are all listed here. HMS Hampshire (which had been present at the Battle of Jutland but not engaged directly in the action) had set out from Scapa Flow, earlier that fateful day with two destroyer escorts. Because of severe north easterly gales the route for the voyage was switched at the last minute away from an easterly passage up the Orkney's to a westerly and more sheltered route up the west side along a route not regularly swept for mines. It was thought that no German mine layer would dare to operate this close to the mighty naval base of Scapa Flow. The storm centre however passed overhead and the wind backed to the northwest. Far from a sheltered passage Hampshire and her escorts now found themselves battling high winds and heavy seas. The two destroyers struggled to keep up with the heavier Hampshire and soon were falling far behind. They were ordered to return to base and Hampshire went on a lone pitching and rolling in the Force 9 winds, but maintaining a speed of 13.5 knots. When she was about one and a half miles offshore between Marwick Head and the Brough of Birsay a rumbling explosion shook the whole ship tearing a huge hole in her keel between her bridge and her bow after she hit a mine believed to have been from the mine laying German submarine U-75. The helm jammed and the lights gradually went out as the power failed. She immediately began to settle into the water and clouds of brown suffocating smoke poured out from below decks. The crew streamed aft away from the explosion. A call went out "Make way for Lord Kitchener" and he passed by, clad in a greatcoat and went up the after hatch. He was never seen again and it is assumed that he went down with the ship.